Everything came from Amazon, so I’m using exact product and vendor names to make the little bits easier to find, and the hyperlinks will take you to those pages*. 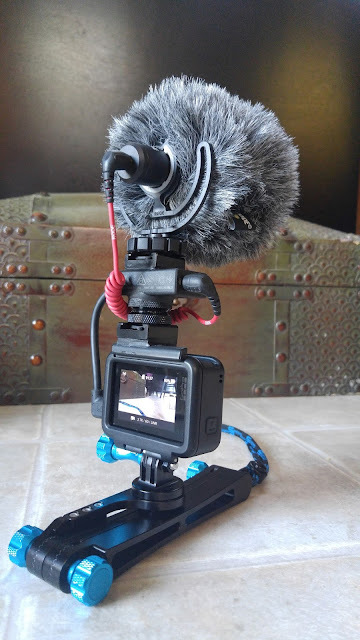 Rode VideoMicro w/ the Rycote Lyre shock mount and red 3.5mm-3.5mm cable. 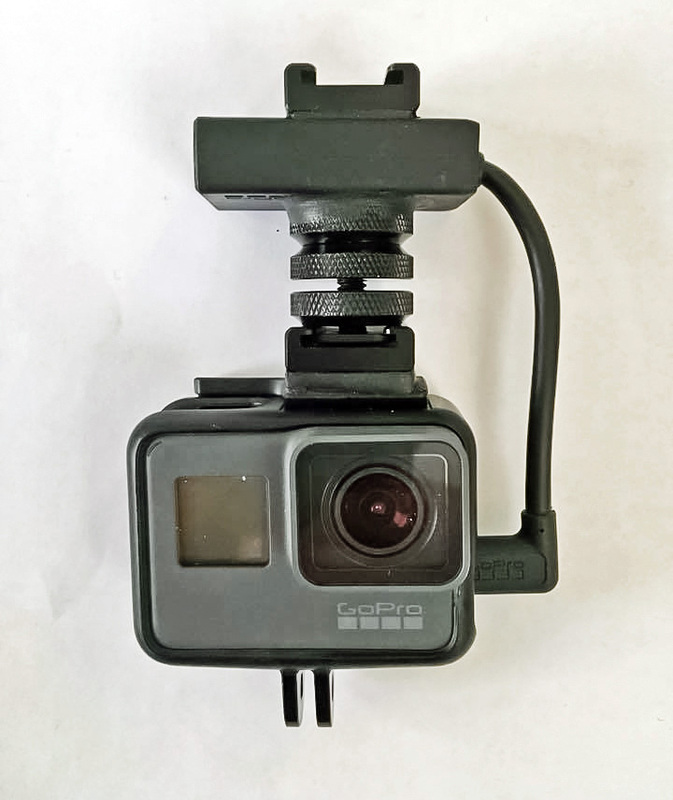 Clean the top of the GoPro frame latch with soap and water, and dry thoroughly. Sand the area of the latch on the side adjacent to the cable port, and the bottom of one of the cold shoe mounts. Clean off the dust. I used the better half of one pkg of Sugru to accommodate the curved surface of the latch. Each pkg has a slab of Sugru that’s about 1/8 x2. Using a sharp knife, and the mount as a guide, slice two chunks the width of the mount. Place them on the bottom of the mount. Take care to orient the mount so you can slide a shoe in from behind. Line up the mount to the edge of the latch closest to the cable port, and press it firmly into place. The Sugru will bulge out of the sides. It can be trimmed with the knife. It can also be molded at this point with wet fingers, or with a wet q-tip. The mount comes with screws and Allen wrenches. 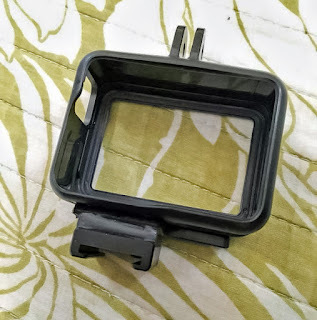 I had considered drilling holes into the top of the frame latch to provide the extra security, but decided to try just the Sugru first. 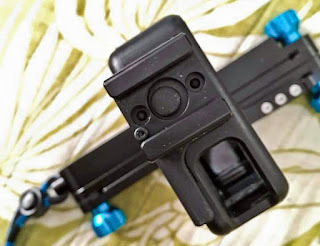 When you press the mount onto the latch, Sugru pushes up thru the screw holes. Use a wet qtip to push it down. Set it aside to cure 24 hours. After it cures, this will add a lot of stability. Open one package of the male mounts, remove one of the knurled knobs, and throw the rest in yer parts bin. 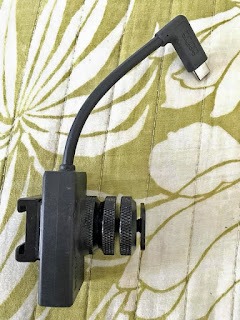 Clean the top and bottom of the mic adaptor with soap and water - without getting any on the cable inputs! Dry thoroughly. Sand and clean the adaptor, and the flat bottom of the knurled knob. Place one square of Sugru on the bottom of the knob. Line it all up so that the side of the adaptor with the cable will line up with the side of the camera with the USB port. Press the knurled knob firmly onto the bottom of the adaptor. Clean up sugru as desired. It would be best to set this aside to let it cure 24 hrs before continuing, but if yer as impatient as I was, carry on. Carefully. Carefully clean the mic adaptor directly above the knurled knob with soap and water. Sand and clean the bottom of the remaining cold shoe mount, and the top of the adaptor. Place a slab of Sugru on the mount, check to make sure you can slide the mic in from the back, line it up so it’s in line with everything else, and press it in place. Use a wet qtip to press down any Sugru that came up thru the holes. Cure for 24 hrs. Slide the male cold shoe adapter into the cold shoe on the camera frame, and tighten the bottom knurled knob down to lock it in. 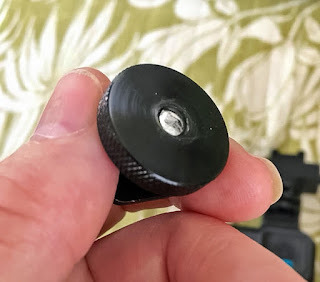 Screw the mic adaptor onto the top of the male cold shoe adapter (don't over tighten), and tighten the top knurled knob up to lock it in place. Plug the adaptor cable into the USB port on the side of the camera. Slip the mic into the cold shoe on top of the adaptor, plug the red cable into the adaptor, and go make movies! The USB cable is a tight fit on mine. I might have gained a little slack had I lined up the first cold shoe with the edge of the latch as I detailed above. In the pic above, you can see a few threads space between the knurled knobs. One needs some space to loosen and tighten the knobs, but one can probably file/grind a bit off the end of that screw. 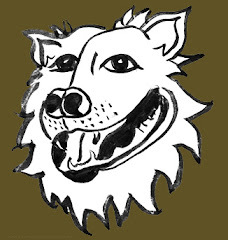 Good luck and tell me how your's goes together! 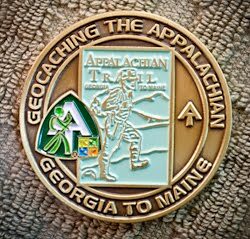 * I have no personal or financial relationship with any of the vendors, and gain nothing from you choosing these products or clicking these links.